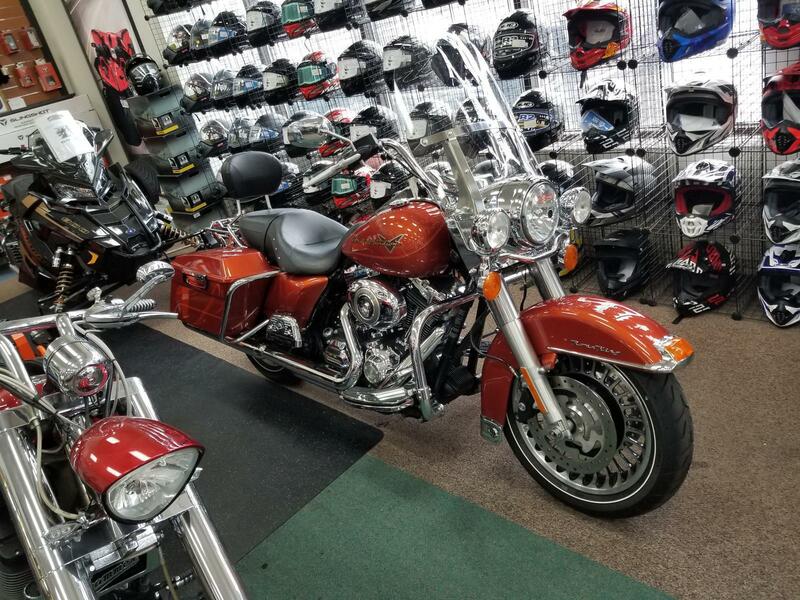 The 2011 Harley-Davidson® Road King FLHR is powered with a Twin Cam 96 engine styled to perfection with the performance you need for Harley touring. The Road King FLHR has a classic Hiawatha headlamp that is a defining feature of this bike. Big and commanding, the Harley Road King headlamp hearkens back to the Big Twins of the 60s. You get nothing less than the latest in materials and technology. Clear-lens reflector optics provide a longer distance high beam and wider low beam to light up your Harley touring experience. It's a bright, striking daytime lamp that blasts a little further into the night. 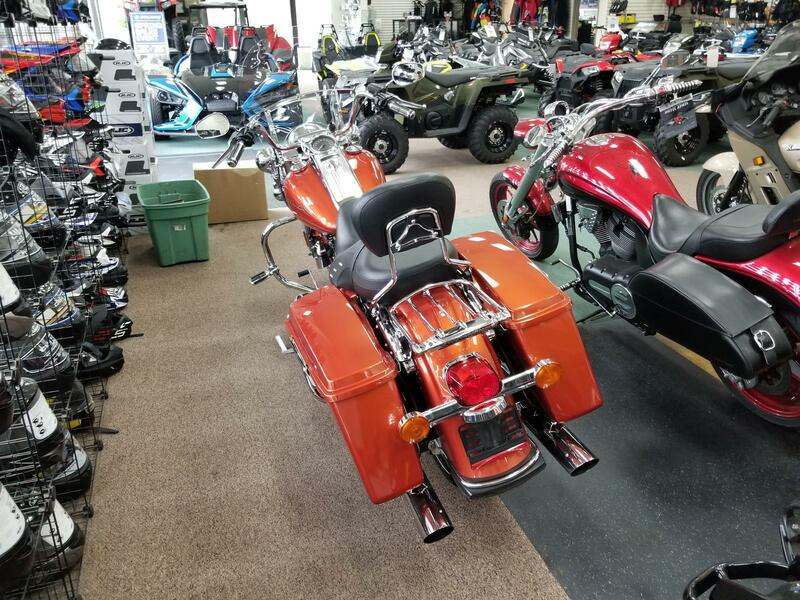 Harley has many other touring motorcycles to take a look at including ones with motorcycle luggage capacity and a unique frame mounted Harley fairing. Take time to discover more motorcycle touring bikes such as the Harley Street Glide. Tank-mounted gauges: Tank-mounted fuel gauges boast traditional styling while offering you a clean, unobstructed view of the electric speedometer and odometer. A little chrome never hurts either. You'll only find these unique gauges on the Road King® and Road King® Classic models. Low mounted license plate: We keep the back end clean and classy with a low mounted license plate that features little visible hardware. As an extra touch, we throw some LED lighting around the tag for crisp visibility and style--just enough to give your tail end a glow when you're riding through the night. 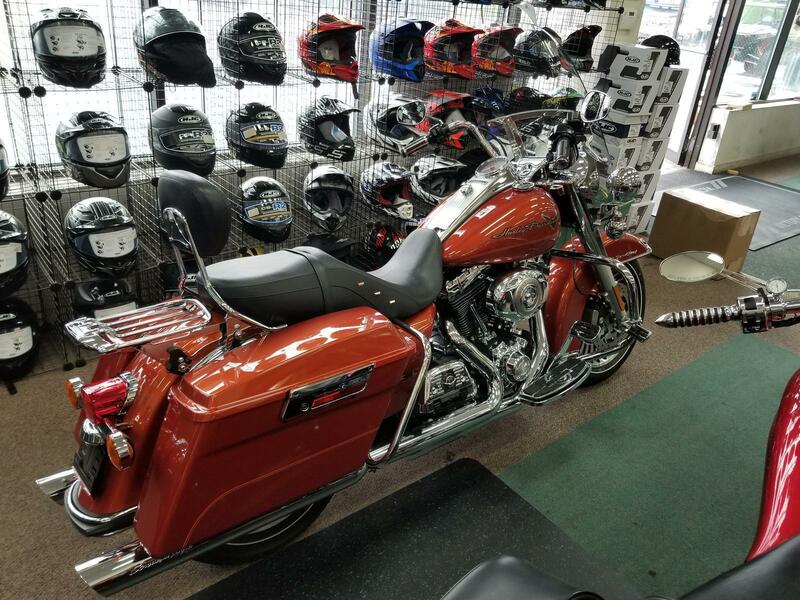 This completes the classic, uncluttered look of the Road King® model. Anti-lock brakes (optional): When it comes to the Road King® model with optional ABS, "stopping power" has a double meaning. The components of our ABS are tastefully hidden within the wheel hub, so you'll still turn heads with clean, streamlined designed. More importantly, though you get certainty in the saddle knowing your bike's going to behave when you need it. 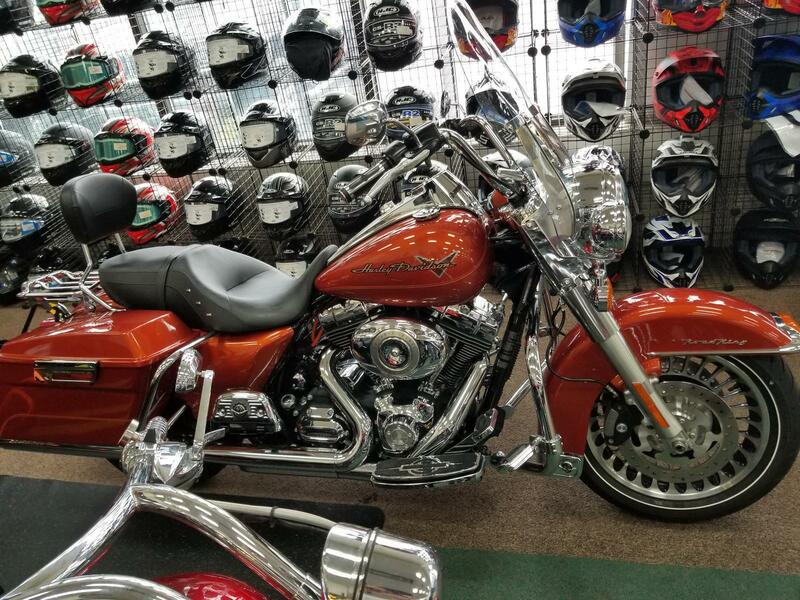 Offered as a part of the "Security Package" (which includes the H-D® Smart Security System). New Two-Up Road King® seat: Another classic feature revamped in 2011 without sacrificing an ounce of nostalgic style: the newly sculpted seat with a deeper contoured bucket and narrower neck. This ultimate Touring saddle relieves pressure on your thighs, while providing more back support and comfort for a wide variety of rider sizes. And the lower seat height--26.5 inches to be exact--puts your feet closer to the road to enhance your confidence. Additionally, the leather trim and premium stitching accentuate the advanced ergonomics while giving the seat that sharp detail you only find on a Harley-Davidson® motorcycle. It's science in service of comfort, and your way to beat fatigue over the long haul. Seat Height, Laden: 26.5 in.